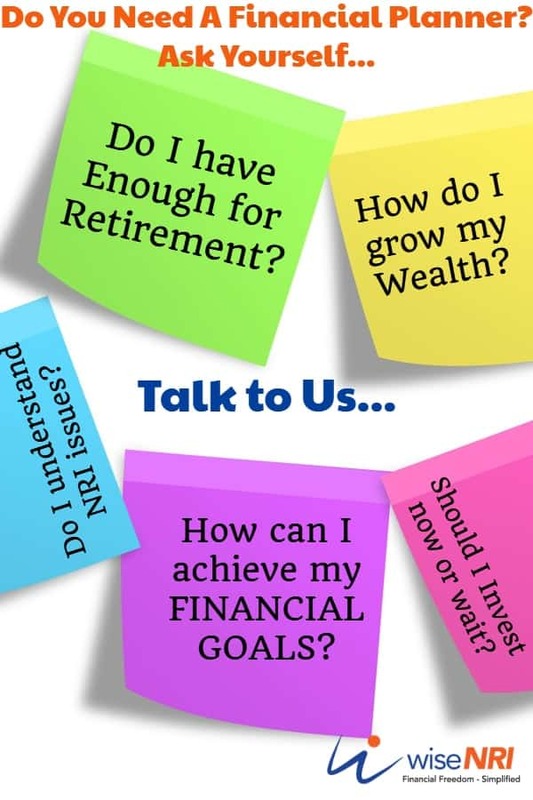 NRIs stay outside India & face challenges in managing their assets in India – they have a couple of options to manage their accounts here. So what should be preferred – Power of attorney, joint account or a mandate holder in bank account? Who is a Mandate Holder in an NRE/NRO account? A Non Resident Indian (NRI) who has an NRE/NRO account can appoint a resident Indian as a mandate holder. The mandate holder can manage the account on behalf of the NRI. The resident Indian has to be a close relative (family member). The mandate holder cannot be a company or a minor. One account can have only one mandate holder. Why should an NRI appoint a mandate holder? The NRI is outside the country most of the time. Sometimes there are financial matters that need physical presence. Many times, the family members need cash urgently and cannot wait for the NRI to transfer cash etc. In such cases, the mandate holder can act on behalf of the NRI and perform the transactions. What are the rights of a Mandate Holder? The mandate holder can carry out day-to-day banking transactions like withdrawing money for local payments, drawing cheques for local disbursements, manage FDs, make investments suitable for NRIs. The NRI can set up a limit on the maximum amount a mandate holder can debit from the account. The mandate holder can also deposit money in the account. What is a Mandate Holder not allowed to do? Open or close an NRI account. Change key details such as name and address in the account. Transfer funds outside of India except to the NRI account holder. Transfer funds as gift to any one. 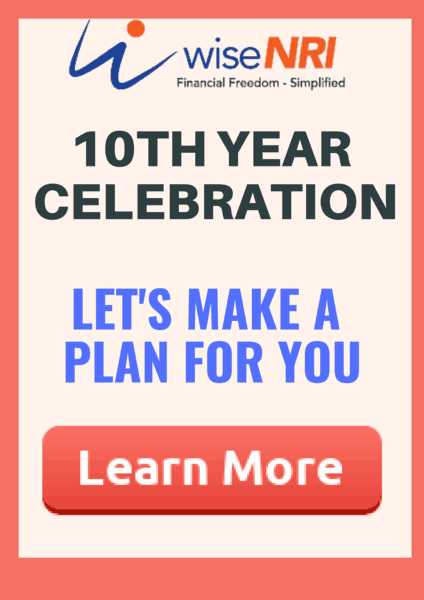 What are the steps to register a Mandate Holder for an NRE/NRO account? Complete the form with signatures of all account holders. Mandate holder submits the form along with KYC details, photographs of mandate holder and self-attested copies of identity proof and address proof of the mandate holder. The copies need to be signed by the account holders as well. The bank approves of the appointment and registers the mandate. A cheque book and an ATM card is sent to the mandate holder. How can a mandate be revoked? The NRI has to submit a request in writing to the bank if the mandate on his NRE/NRO accounts has to revoked. What is the difference between a mandate holder and a nominee? A mandate holder operates the bank account on behalf of the NRI. He/She does not have any rights over the account. A nominee, on the other hand, is the person who will be eligible to claim the balance in the bank account when the account holder expires. The nominee is appointed by the account holder. What is the difference between a mandate holder and a power of attorney? A mandate holder and the power of attorney have similar rights and responsibilities when it comes to the NRI’s bank account. Are there any tax Implications on a Mandate Holder in his role of managing the NRI’s account? The mandate holder does not have any tax implications as the mandate holder acts on behalf of the NRI. Whatever tax implications are there, they are the responsibility of the NRI and he must file his tax returns appropriately. This post is written by Vidya – she is an NRI. 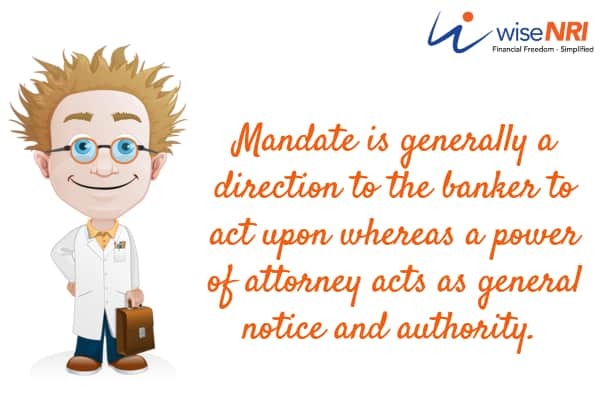 If you have any questions regarding “mandate holder in bank account” – add that in the comment section. can the mandate holder sign cheques for local disbursements? I think I mentioned this in the post. 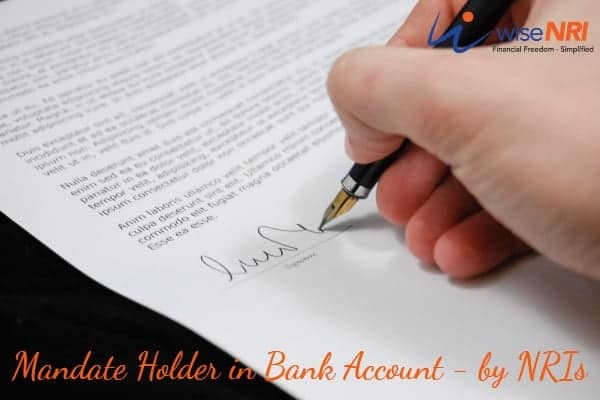 Can Account holder and Mandate holder operate the account simultaneously?